Sheep Producers Australia CEO Graham Smith. 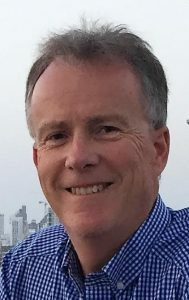 DIFFERENT traceability systems for sheep in Australia’s states will not help the nation’s international competitiveness, according to Sheep Producers of Australia chief executive officer Graham Smith. After a recent two-day fact-finding trip of Victorian saleyards, abattoirs and farms, SPA has decided it will continue to support the voluntary uptake of electronic identification of sheep. But Mr Smith said although the issue is contentious, he wanted to ensure that there was just one traceability system for sheep and lambs across Australia, and preferably based on electronic livestock identification. “At the very least, I think that is very important from a biosecurity point of view,” he said. “Given the number of animal movements across state borders, it’s going to be critical that we end up in that type of situation and it is going to take a while to achieve that. “There is no doubt that by producers working out what is going on in Victoria and talking to a range of people at the coal face it will help to accelerate both our thinking and develop what are the appropriate steps,” he said. Victoria last year mandated the government-subsidised implementation of electronic identification for sheep and goats, and from 1 January 2019, all sheep and non-exempt goats introduced from interstate and born after that date must be electronically tagged before being dispatched from a Victorian property. All other states are proceeding with the mob-based visual tag-based National Livestock Identification System. Government and farmer body representatives on the SPA tour last week came from Western Australia, Tasmania, New South Wales, Victoria and South Australia. Organisations represented included WoolProducers Australia, NSW Farmers, the Pastoralists and Graziers Association of WA, The Victorian Farmers Federation, SAFEMEAT, Agriculture Victoria and the Tasmanian Farmers and Graziers Association. Mr Smith said SPA was trying to facilitate key industry people to look at the early Victorian sheep EID experience “at the coal face” and would possibly hold another fact-finding trip early next year. Mr Smith believed many people did not really understand the benefits that traceability can bring to their businesses, particularly on farm. He said the outstanding issues in a national EID tag uptake include defining the benefits, the price of the tags, data ownership, as well as infrastructure costs and stock agent acceptance. “My view is that we can work through that and while it (the trip) wasn’t a silver bullet it was a useful starting point to get people talking and observing what’s going on in Victoria. Mr Smith said ultimately, Australia’s international customers alone will expect a single traceability system. “So it probably is not ultimately a question of if, but when. “That’s why we want to work with industry and tackle the issues head on, but do it in a way where part of our thinking is influenced by what is going on at the coal-face,” he said. “It’s another component in being internationally competitive in the years ahead, but we need to understand the issues and maturely work our way through those, as opposed to taking fixed positions. Mr Smith said a system with electronic identification tags, and fully integrated with good data capture and management, would be more effective. He said livestock traceability is often considered in the context of “worst case scenarios” of exotic disease outbreaks such as foot and mouth disease, but the New Zealand experience has shown its value in combating lower level incursions such as microplasma bovis and pee weevil, that occurred because of increased trade. SPA trip members at the Ballarat saleyards. The fact-finding group included WoolProducers Australia chief executive officer Jo Hall. “The trip to Victoria provided a chance to observe the challenges and opportunities that have been experienced by different sectors of the sheep supply chain since the implementation of mandatory EID,” she said. 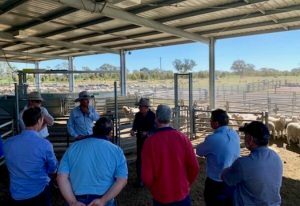 The group visited Gordon Brown’s Shelford property, the new Central Victorian Livestock Exchange’s CVLX new Ballarat saleyard and Colac-based processor, Australian Lamb Company (ALC). In addition to visiting Gordon Brown’s farm to see EID technology in use, the group heard from Colac lamb producer Will Hansen who also uses EID National Livestock Identification System technology on farm and receives regular feedback from ALC. He said this enabled him to lift on-farm productivity by significantly increasing ewe numbers and lamb turn-off per hectare. At the new CVLX saleyard, the group heard from Ballarat saleyard manager Jonathon Crilly who said the yards had developed their own software for the EID technology, with all information collected from agents using modern technology such as tablets and wi-fi. The information is then aggregated and uploaded to the NLIS database and office systems in a matter of hours, significantly reducing office administration time. Agents have their own logins and can only view their own clients’ data. The saleyard set up is full flow-through, with livestock unloaded for drafting and sale via nine unloading ramps. Sheep are scanned as they pass through the drafts, hence agents and saleyards follow their normal practices when scanning EID tagged sheep. The scanning process does not involve additional handling of mobs. An auto drafter, which includes a scale, is expected to be installed to allow auto-drafting of boxed mobs (both at the vendor area and the buyer pens), weighing of selected lots and EID reading of mobs only partly delivered to an abattoir. On the day of the visit, 64,000 sheep and lambs were put through the yards with pre-sale drafting taking 18 hours – a similar drafting rate to that prior to EID. All EID tagged sheep and lambs must be scanned though electronic readers, with agents required to take remedial action where the read rate of a line of sheep or lambs is below 80 percent. This typically occurs when mobs contain a significant number of untagged sheep. The tour group was told that the read rate requirement will increase to 90pc on March 31, 2019, with the expectation that Agriculture Victoria will move it to 98pc in future. All Victorian saleyards are currently reading close to 100pc of electronic NLIS tags. At ALC, the group was told the introduction of EID in abattoirs had significantly simplified the re-introduction of carcases to their correct line after being placed on the retain rail for further inspection or trimming, ensuring accurate PIC of consignment for each individual carcass. The tour group members were told abattoir scanning rates have been reported to range from 93-99.6pc, with routine uploading by plants of kill files to the NLIS database. EID technology does not have any impact on processing speed, but abattoirs are required to ensure that readers operate at all times. Agriculture Victoria has found, like any tagging system, that incorrect placement of EID NLIS tags can result in losses occurring on-farm or as the livestock move through the supply chain. The minimum cost of a tag, as a result of Agriculture Victoria’s tag tender process and online tag-ordering service, will increase from $0.45 a tag to $0.55 on January 1, 2019. Hi Robin, I agree with your comments. That’s why I’m putting it “out there”; to get some debate going> So any suggestions on what we should do to try to change the situation will be gratefully received. Cheers, Graham. Where have you been for the last 40 years? There has been little or no agreement between states on agriculture over this period. The state reps have their meetings together and go home and most times do the direct opposite to what they have agreed. While the states control these things – good luck. I’ve been dealing as an agent both sides of the border for 30-plus years and it has always been hard work and frustrating. I hope in your position you may have some luck changing it.